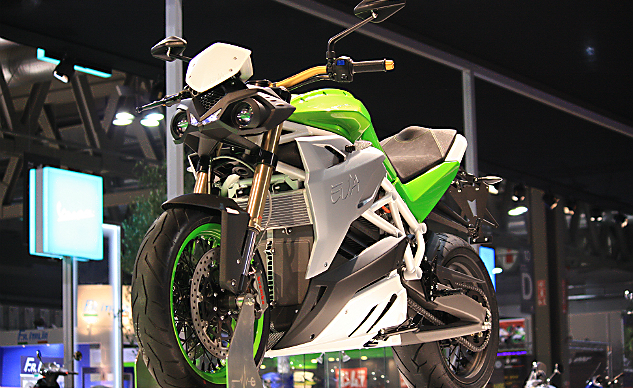 Known for its electric superbike, the Ego, Energica had on display at EICMA the streetfighter version of its 150 mph, 134 hp, and 144 lb.-ft. of torque stablemate, the Eva. Based on the same platform of the Ego, the Energica Eva is a product of the CRP Group, better known in F1 racing circles and located in Modena, Italy. Like the Ego, the Eva features a color TFT instrument cluster. Equally important, Energica Motor Company announced at EICMA the formation of its U.S. corporate base of operations in Delaware, as well as its first U. S. dealership, Newport Italian, in Costa Mesa, California. Two other dealerships will soon be opening at Elenio in Munich, Germany and Pogliani Motorcycles in Milan, Italy. On display with the Eva at EICMA were three iterations of the Ego in Matte Pearl White, Matte Black and Ego45 Carbon. 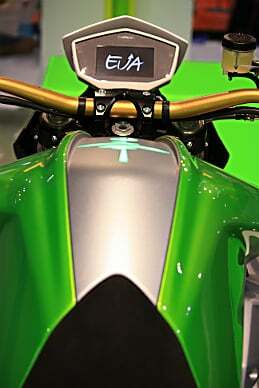 Follow the rest of our 2014 EICMA Show coverage for more information on new 2015 motorcycle announcements.